Sequel’s latest Association for Strategic Practitioners in Internal Communications (Aspic) breakfast seminar proved that comms people – while not ready to pack away our keyboards just yet – are fully embracing the power of visual communication in sharing our messages. We brought together Julian Burton, Director of Delta7 Change, and Marcus Dubois, Producer for HSBC, to talk about ‘High impact visual communication’ and their presentations chalked up remarkably well with the writers in the room. Julian Burton, Director for Delta7 Change Ltd.
At Delta7 Change, Julian uses drawing and pictures to give employees a space where they can ask what they would and could do differently in their companies. For him, pictures offer a fresh way to start the conversation and develop a story – a concept he appropriately displayed by bringing a large example of his work to the seminar. 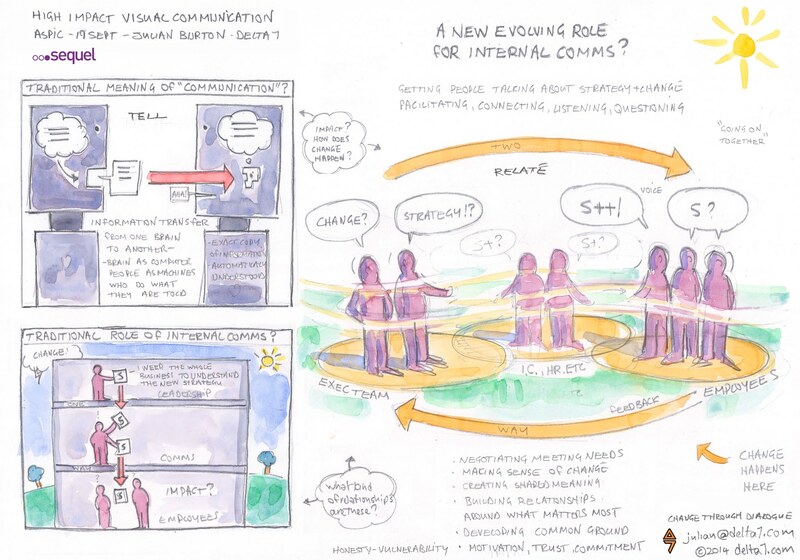 True to his approach, Julian delivered his thoughts, on the traditional meaning of ‘communication’ and how internal communications is evolving, through his own sketch which he asked attendees to discuss together, demonstrating how the images Delta7 produces for clients are used to drive conversations. 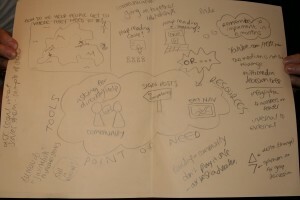 A number of audience members asked how they could get senior leaders to agree to draw their thoughts and feelings. Though sometimes initially difficult, Julian says they often become the biggest advocates once they begin to see the meanings illustrated. 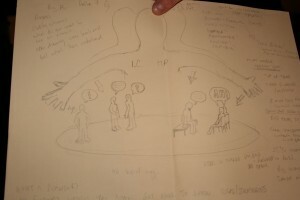 In his experience, once the drawing begins, senior staff will be the first to stand up, say ‘no that’s not right…’ and begin editing the images – effectively starting the conversation. Next, it was time for Aspic attendees to take on the challenge: think of an issue at work, and draw it. Though the quality of the sketches was, understandably, a bit hit and miss, the discussions and debates they sparked were not. As a Producer on HSBC’s award-winning HSBC Now video channel, Marcus is an expert in storytelling through the moving image. The channel, hosted on YouTube, showcases videos of HSBC employees telling their extraordinary stories to the public and is an excellent example of the blurring lines between internal and external communications. HSBC has had an impressive response to their videos, with an average of 40,000 views per week and the most popular episode receiving more than 70,000 total views. From an internal comms perspective, the films mean that, 72% of employees now trust messages from senior managers and 83% of employees support HSBC’s brand values, according to their employee surveys. So, how have they achieved this? Most importantly, they need a clear purpose or message; you need to be able to ‘find a single thread through a story’, he says. A question he is always asked, and Aspic was no exception, is how did the team manage to get the buy-in needed to move from internal to external? Putting HSBC’s stories into the public domain was a risky move that senior leaders in other organisations might be hesitant to sanction. The content gets approved by the HSBC Board and his team put together clear plans and processes for how the channel would run, to prove they were capable of handling it professionally. He also worked closely with the global legal department, asking the important question, ‘What terrifies you about this?’, to answer their worries. It was an interactive, insightful and informative seminar and we’ve had some brilliant feedback from attendees. A big thank you to our excellent speakers, Julian and Marcus. Our next Aspic seminar will be held in December. If you have any questions about Aspic please email Sally.Longstaff@sequelgroup.co.uk.